I go to London regularly, mostly for work occiasionally for pure frivolity, other times to see my osteopath. Whatever the reasons for my visits I like to try and pop back to old haunts – favourite cafes, quick cut-throughs and the odd shop. It gives me an opportunity to pick up bits that are much more difficult to find here on the coast. So I go to a favourite coffee shop and buy their monthly special, I may pop into an Italian deli but I always seem to pay a visit to some of the grocery shops in China Town. I might pick up firm tofu for frying, sheets of wonton wrappers, jars of sauces and spices, but it is their fresh produce sections that has me searching out favourites and looking for what is at it’s best – fresh curry leaves, highly pungent and aromatic (the leaves are picked off once at home and are frozen for later use), bags of oriental greens and beans for times when the slugs and snails are doing their best to demolish my gardening efforts. And occasionally I’ll wander in and something will grab my attention – yes a green papaya. Green Papaya salad is a quintessential Thai salad – hot and sour, sweet and crunchy. Perfect as a starter, on it’s own, a light lunch, you name it. What I’ve done here is combined recipes from three of my favourite cooks – Mai Kaidee, Rick Stein and David Thompson. Mai’s version is vegetarian so doesn’t use the fish sauce, she uses soy or seasoning sauce instead – you choose. From a whole green papaya I made two batches of this salad – the papaya kept well in the fridge wrapped in some cling film or if you are Australian Glad Wrap – I love that name! Peel and halve a green papaya, and then scoop out and discard the seeds. What to do if you don’t have green papaya? I’ve been trying to find alternatives to green papaya – I’ve used white cabbage which is good, but different, also the same with carrot. I’d like to try using white turnip as that seems to come up as an alternative – but as I’ve only just sown the seeds it will be a while before I get to taste it! Do you have any suggestions or alternatives, I’d love to hear them as I do love this salad but can’t always get green papaya. That’s a great point about how it’s served! I think using the cabbage makes it into a Thai style coleslaw. I have never tried green papaya! Could you use green mangoes? I see your thinking Tandy, and to be honest I have no idea. The green papaya is a bit fleshy (if you see what I mean) whereas cabbage is much harder and doesn’t take in the flavours as well. So maybe it’s worth a try, especially if you can get hold of green mangoes easily and cheaply. I think it would work with the turnip as it has a bit of flesh to it, so it can absorb the flavours more easily. And thanks for stopping by! Claire, have you tried shopping at Wing Yip in Croydon? You can also shop online at http://www.wingyipstore.co.uk/ We go to Wing Yip when we want authentic ingredients. We had this in Guam when I was little! I am still looking for the exact recipe we had, but I’ll try this in the meantime! Thanks! It would be lovely to see how the recipes compare, but in the menatime I hope you enjoy this one ! I love Green Papaya Salad. Thank you for the recipe. I love Thai salads…spicy and crunchy. I have heard that daikon makes a good substitute for green papaya but have not tried it myself. 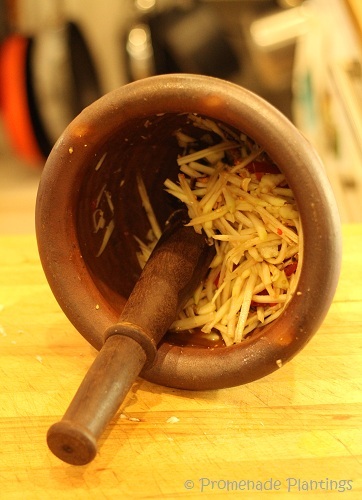 so glad you can find a green papaya in london, we grow them and love the classic Thai salad …. our papayas never quite ripen to sweetness (too far south) so we eat them green in this mouth-tingling manner! This is my favorite Thai salad, made with fish sauce. 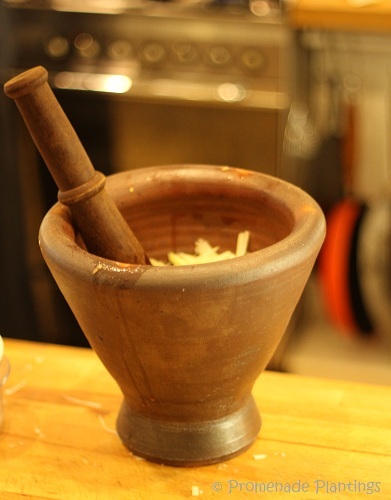 It’s often served with shrimp (prawns) and some people put tiny dried shrimp in the dressing, mashed up in your mortar. When I was at college (university) I had a roommate from Thailand. She taught me to make this with carrots because green papaya was not then available in Santa Barbara. I’ll have to try it with baby turnips next winter or spring. I have also used the dressing on chunks of melon in the summer. How fantastic that you had a roommate to teach you this great dish. And yes I’ve had it with those tiny dried shrimp in, and it does take it to another level. I was wondering about trying it with kohl rabi, but as the first batch of seedlings were mown down by slugs, and I’ve only just sowed the 2nd batch I will have to wait for a while. And now you have planted a great idea, using melon – I’m imagining the sweetness of the melon with the sourness of the dressing. It’s so interesting all the different ways food can be used – especially when someone is clever enough (or hungry enough) to expand beyond the “ripe” options and into the “underripe” or “overripe” possibilities as well! Thanks for sharing the recipe, we may just have to try it! It is even hard for me to find green papaya living in Hong Kong. I guess we will all just have to visit Thailand more often. That sounds like a great alternative/substitute! This salad looks really delicious. I’ll have to make it soon! Hi Debra, I know what you mean about a local rule, I don’t have it in the same sense as you, othewise I wouldn’t get to eat citrus. I do try and stick to Europe, but then coconuts, mangoes and the odd delicacy and in I charge! Oh, and this recipe goes onto my bulletin board for that hoped-for day! Happy searching! But I think the carrot or the turnip versions do well too! Thanks Celia, yes you need to peel it and then scoop the seeds out befor eyou start slicing or grating or using a mandolin. I’ll go and tweek the recipe! What a nice mix of flavors! That’s what I appreciate most about Thai recipes: each ingredient contributes, but maintains its distinctive individual flavor. Thanks! I think you have put your finger on why Thai cusines is so wonderful – you can taste each and every flavour, they all add to the dish, but never seem to overwhem each other. Claire, A green papaya IS hard to find, but it is so worth it! This is hands down my favorite Thai salad! Q: I grew white turnips for the first time this year. They started out sweet and then suddenly turned very bitter. Any clue as to what the cause could be? It is easily my favourite Thai salad too! Shame about the turnips Linda – I wonder if it was a case of getting old / too dry / stressed. I know that things can get bitter when they get old – like greens and it is a brassica, so I’m wondering if they got old and grumpy?! I’m hoping mine make it past the seedling stage befor ethe slugs and bugs get to them first!! I’ve just come back from 3 weeks in Thailand, with cooking classes in Bangkok, Krabi and Chiang Mai, and in each case they recommended using carrot for bulk, green apple to replace the sweet-tang of the papaya, and a bit of dikon radish to offset any sweetness. You can use cucumber or carrot as a substitute, along with tart green apple. I’ve used a spiralizer, too, for these substitutes. Sometimes they are fun changes to make.